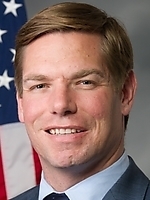 Info Eric Swalwell was raised in Dublin and graduated from Dublin High School. Since 2006, has served as a prosecutor for the Alameda County District Attorney's Office, where he has prosecuted over 1,000 cases and 32 jury trials, including murder, human-trafficking, domestic violence, sexual assault, burglary and fraud. In 2009, Eric received the Bay Area Mothers Against Drunk Driving Award for Community Service. In 2006, Eric was appointed to the City of Dublin’s Heritage & Cultural Arts Commission where he later served as chairperson. From 2008 to 2010, Eric served on the City of Dublin Planning Commission where he worked to re-start Dublin's economy, enticing businesses back to Dublin and working to expedite development projects and fill vacant commercial real estate sites. In November 2010, Eric was elected to the Dublin City Council. On the Council, Eric passed an initiative to connect Dublin with the Livermore Valley Wine Region and sits on the City's newly created Sub-Committee on Wine Connectivity. Eric received a Bachelor of Arts Degree in Government and Politics from the University of Maryland and a Juris Doctorate from the University of Maryland School of Law. While at Maryland, Eric served on the City of College Park City Council as its student representative. From 2001-2002, Eric worked in Washington, D.C. for Congresswoman Ellen Tauscher, assisting with legislative research and constituent outreach and services. Upon returning home to Dublin, Eric founded and still serves as President of the Dublin High School Alumni Association. Today, Eric serves in an advisory capacity on the Alameda County Fire Commission, the Alameda County Library Advisory Board and the Tri-Valley Conservancy. Eric is also a member of the Dublin Sister-City Association and the Dublin Lions Club. A former NCAA Division One soccer scholarship athlete, Eric enjoys coaching local youth soccer players. From 2006-2009, Eric coached youth soccer and was a director for the San Ramon Soccer Club. Eric is also proud to have assisted in coaching the Dublin High Energy to the first girls' soccer state championship in Dublin history. 06/02/2020 CA District 15 - Open Primary ??? 03/17/2020 AZ US President - D Primary ??? 02/09/2020 US President - D Primaries ?? ?